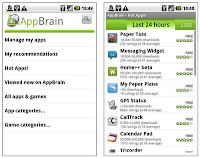 Droyd Cantina: AppBrain Adds Web-Install. Makes Android Marketplace Great! 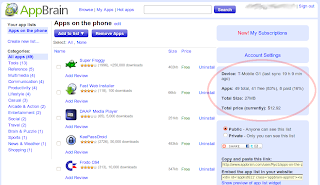 AppBrain Adds Web-Install. Makes Android Marketplace Great! All the moaning about the bad Android Marketplace were always kind of moaning about freedom of choice. But now there is something that helps users to get a sorted list with many options. 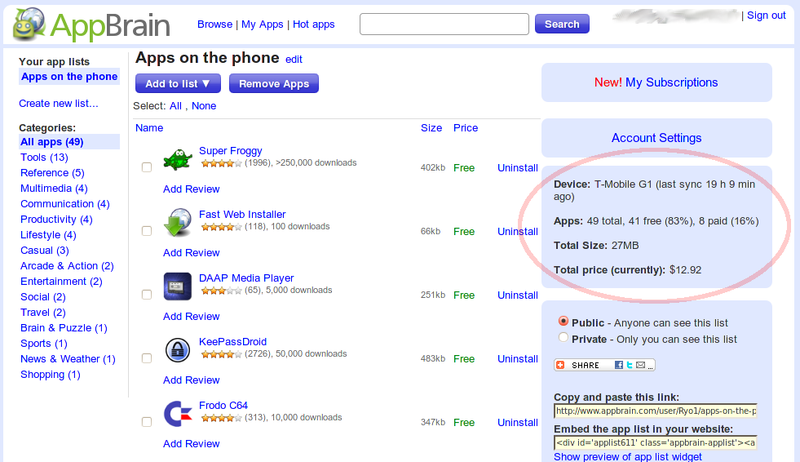 A list of "Hot Apps", recommendations based on your apps on the phone, and you can browse through different categories. You can however get all apps, but it's sorted nicely and you won't see spam apps in the first place, but you can access all the apps. It's really a breeze. That's the good thing about freedom. If you don't like something, you can make it better. The team from Swiss Code Monkeys did it great! Another big thing is that you can show some stats to yourself privately or to the public (!) like Leo Laporte is doing it. You can see what percentage of apps are free and paid, and you can see the amount of money you spent on currently installed apps (not everything you bought). This gives a little push to spent more money for the developers, and you can show it :). The web-interface is par excellence in terms of functionality. Watch the small options on the end of the site. Finally you can show the price in the currency you like. Just can't wait to get an web-uninstall feature, too. So you would be able to completely manage your apps on the web. I'm sure this is coming. 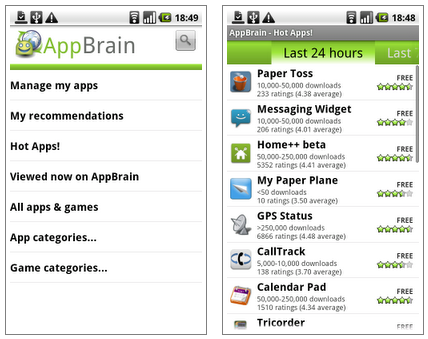 And little changings are needed in my opinion when installing apps from the AppBrain app on the phone itself. It starts up the normal marketplace app which takes a while.